Are England now the best in the world? News from the South Seas where the previously unbeaten (well "previous" to the start of 2008) New Zealand sevens team has lost again. Twice. This time to Australia (not exactly a major power in the world of women's rugby). That's four defeats this year (balanced only by wins over Fiji, Samoa and Niue Island). While its rather hard to draw many conclusions about 15s rugby based on Sevens, as decline in form goes this is pretty steep, and there is little else to go on - since the World Cup the Kiwis have played only two full internationals last October, both comfortable home wins over Australia (a nation not even in the top six in world rugby). England, on the other hand, have played 18 internationals since that day in Edmonton, winning 17 and drawing one against Spain when they entered an understrength development team in the 2007 FIRA tournament (a tournament they still went on to win). The other internationals have featured invariably comfortable wins over every other team in the top six, except Canada who England will meet in month's time. The retreat into antipodean isolation by New Zealand in between World Cups is nothing new, and England have thought themselves superior in the past - only to get a rude shock. But never before have England been so on top at all levels against all comers in all forms of the game. Not only are the full team and sevens teams unbeaten since September 2006, but the "A" team are 100% against other national XVs, as are the U20s who recently won the first age group Nations Cup in Canada at a canter. The only reverse of any sort has been the defeat of the TDG U18 team to the Canadians in the spring, a game that the RFUW do not consider an international. So are England now ahead of the Kiwis? The (frankly criminal) lack of money in women's rugby is likely to restrict any direct match-ups between the teams, outside of maybe an England tour down-under, so who can say - but New Zealand will have run up some pretty comprehensive wins over Australia in October if they want to make us believe that they are still number one. The world's greatest sporting spectacle begins in less than two weeks time. The Olympic Games will see a significant proportion of the world's population, at least those with access to TV, spending two weeks caring passionately about the outcome of sports they would not normally cross the street to watch, even if they knew they existed at all. Sport where home athletes do well can see explosions in popularity as children in particular take their new heroes to their hearts, and seek to emulate them. And Rugby Union, a sport with an Olympic history a quarter of a century long and a sport whose ideals (on paper at least) match those of the Olympic movement closer than practically any other, will again not be at the party. In fact its not been there since 1924, and won't be there in 2012 either (despite there being two "vacancies" following the ejection of baseball and softball from the 2012 games). Those of us involved in the game are repeatedly told that its only a matter of time. The success of Sevens at the Commonwealth Games means that the IOC (who run the Olympics) are desperate to get rugby back into the Games. Rugby's failure to get into 2012 was an aberration, based on protest votes connected with softball's rejection/a botched vote/the need for some minor tweaks here and there (delete as applicable). Its inevitable. Watch this space. Well, while researching various aspects of the women's game and the barriers that are in the way of its expansion, one thing I have found as is that this is a complete fiction. As things stand there is practically no chance that rugby will get into the Olympics in my lifetime or, I dare say, yours. At least not without quite radical change. The IOC voted on sports to replace softball and baseball in 2005. From the reaction of rugby's authorities you'd think the game missed out by a hair's breadth - the technicality of not getting a two thirds vote. Unfortunately when you look into it you find that rugby did not finish top at all. It wasn't even in the top two. In fact rugby finished behind karate and squash in the overall voting process, and roller skating gained more votes than rugby in the first round of voting! Why? Well there are lots of reasons and a fascinating report published at the weekend goes into them in some detail, but the Big One is clearly the position of the women's game. 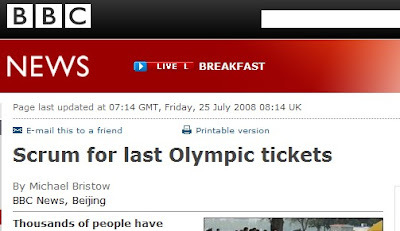 The impression often given by the press is that the IOC is a cynical, money grabbing, corrupt fiefdom run by an unelected group of self-seeking nobodies who use the games to finance a continual globe-trotting junket. Well, that makes grat hadlines and there may have been elements of truth in that in a very few cases, but in fact the IOC remains a remarkably and overwhelmingly very idealistic organisation, and one of its major preoccupations is equality. The promotion of women in sport is central to the Olympic movement, and has been for maybe 50 years now - or more. Though some existing sports in the Olympics remain male only (boxing, for instance), they are few - and decreasing (football now has men's and women's events) and no sport joining the Olympic Games since... well, the war? ... has been male only, or even predominantly so. Perhaps as a result of this we now have a few, frankly, cosmetic attempts to up the position of women's rugby. Surprise, surprise shortly after 2005 it was announced there will be a women's event at the Rugby Sevens world cup next year (not the main 15s world cup, you note - an event due to take place in less than two years but which the IRB have still not bothered to announce a venue for). Even then "at" is an interesting word. There are no details yet but when you look into it you find that the commitment is that the women's event will be "in the same city", not necessarily at the main stadium. This could mean miles away - Dubai isn't a small place. And if you doubt that and think I exaggerate then ask yourself where the recent Women's Home Nations Sevens took place in Edinburgh when that was supposed to be played as a "companion" to Scotland's round in the IRB Sevens Tour? In the main stadium? No - on some training pitches outside. And if you think that this was due to there being no time for the games to be played at Murryfield itself then that is also not true - from what one hears many of the women's games were being played when there were actually gaps in the main schedule. So if you were looking forward to watching live TV coverage of the women's Sevens world cup then I suggest you come up with a back-up plan - you'll probably need it. Moreover the commitment of individual IRB members to even this "advancement" of the women's game is not exactly outstanding. Of the eight "founder members" who - to all intents and purpose - run the world game two declined to even enter their women's teams in the world cup qualifiers! Can you imagine that happening in men's rugby? The Scots in particular pulled out of the European qualifying tournament at the last minute for the most pathetic - and blatantly sexist - of reasons. Basically the SRU chose to fund a men's tour of Argentina in preference to the women's sevens team visiting Germany for the qualifiers because "the Scotland Men’s team is one of the primary commercial assets of the SRU and investment is therefore substantially higher". Translated from PR Speak into English this means that as women can - by definition - never contribute to the SRU's "primary commercial asset" they will never be other than second class citizens in Scottish rugby and last in line when the money is handed out. To say this is incompatible with Olympic ideals is to underplay it - to very idea that commercial concerns should come ahead of even a pretence at equality is the complete reverse of the IOC's basic beliefs. In fact when you look at it in detail its even worse than that - the visit to Argentina was a non-competitive series of friendlies the result of which I'd challenge any other than the most dedicated follower to even remember, while the women's Sevens was the first stage in a world championship!! But at least Scotland went through the process of making a decision - Ireland never entered in the first place. Perhaps the cost was too high? After all the Brazilian and Czech and Isreali and Niue Island RFUs (all of whom did enter the event) are sooooo much better funded than the SRU and IRU! Hmmmmm..... I can see the IOC being very impressed by that! There is more - much more - that punctures the balloon suggesting that rugby is a world sport to rival only football, but as these are not all women's rugby related I refer you to the report on Total Flanker and the full report itself. All I will do is conclude this with the observation that those involved in women's rugby are invariably too easily pleased with the scrapings that the game allow to fall from the table. The IOC - and governmental bodies like Sport England - provide the women's game with bucket-loads of ammunition to aim at those in authority. Even the IRB have policy statements that national unions are supposed to follow, while the RFU has made similar commitments that CB's wilfully ignore. Let's make these words into actions. And yes it'll upset the suits currently in power, and yes they will complain, and yes they'll threaten all kinds of dire things, and yes you'll be crossed off a few Christmas card lists - but unless the game fights its own corner then it will remain where it is. "Take care to get what you like or you will be forced to like what you get." This is rather a techie post, but I can't believe that I am the only person who uses RSS newsfeeds to keep an eye on whats going on around the net. For those not in the know most news sites and blogs have newsfeeds - RSS, Atom or whatever. This one does (you can set one up using the "subscribe to newsfeed" link in the right-hand column). With a feedreader (iGoogle being my favourite) you can have the headlines from all your favourite news sources on one page, and be able to see at a glance when something new has been published instead of having to remember to visit dozens of sites individually. Anyway... one important website that does not have any form of newsfeed (despite being a blog-type site) is the main Letchworth Rugby Club website. Unless you visit the site every day you risk missing something. Well, not any more. The latest headlines from the main club news page, plus the calendar and Dave Sharp's chairman's blog, now appear on the left (any other pages that we should be watching?). It uses a service called Page2RSS which allows you to create a newsfeed from almost any webpage. Its not perfect, but its better than no link at all - and this way it means you will never miss a club AGM again! Big headlines (well, big for women's sport) yesterday about a new "Commission on the Future of Women’s Sport", to be chaired by Dame Tanni Grey-Thomson and including Dame Kelly Holmes, Heather Rabbatts (deputy chair of Millwall football club), and Ed Smith (journalist and former cricketer). Building on a series of reports from the Women’s Sport and Fitness Foundation’s (WSFF) highlighting the low number of women and girls who play sport, and the almost invisible media profile of women's sport, it all sounds good stuff. The Commission had a ministerial launch and received coverage in most national newspapers, and on BBC News, generating more coverage for women's sport in a single day that it normally gets in a month or more. The aim of the Commission will be to find ways to overcome the barriers in the way of girls and women playing sport. Press releases and stories were fulsome yesterday in their listings of under-representation of women in sport and commitments from Grey-Thompson to find ways to overcome them. But (you knew that was coming, didn't you) when you look a bit deeper into this you find... nothing. This is an independent commission (well, its a WSFF commission in fact), which means it is reporting to no-one and it is not insignificant that neither Sport England nor the DCMS (home of the minister who was at the launch) give the Commission's launch any mention at all on their own websites. At this point alarm bells begin to ring because if neither of these bodies are on board at the start (and if they were you bet their press offices would say so) then neither will have any commitment to implement any of the Commission's eventual findings. To demonstrate why that is important you need only look at the dozens of reports WSFF have produced recent years. Superbly researched, convincingly argued, and largely ignored outside an audience of the already converted. Little has changed as a result of the WSFF's work, in rugby or elsewhere. On the other hand a single line in a Sport England paper last month - "NGBs failing to make specific provision for women’s sport will see funding switched to those that do" - appears to have had a galvanising effect on the merger talks between RFU and RFUW, which had been going no-where slowly for some years. No doubt they'd deny this and say that its all a co-incidence, but looking at the timing of the Sport England statement and the breakthrough of the RFU/RFUW "Integration" policy, its a pretty remarkable one. WSFF do some great work - their recent 11 reasons why sports should work with women and girls should be required reading by any sports club, never mind county association or governing body. The only teeny snag with the WSFF and the Commission is that until ministers and Sport England officials do more than simply turn up at press launches the people who need to read and act on these reports most are those least likely to do anything about them. There are times when compelling argument works, and times when a big stick speaks louder. An example of that might be the on-going story of rugby and the Olympic Games - more on that later. National 10s is dead... Long Live the National 10s! The RFUW have now pretty much confirmed that they will not be running the National 10s next season - but that does not mean there will no National 10s because, while you've all been writing into RFUW, we've been working on an back-up plan - and pretty exciting it is too! Remember the article about Gloucester Girls Rugby? Well, we've been talking and GGR, Gloucester RFC and Premier Rugby Ltd are very interested indeed in running a national finals for the 10s next spring. At this early stage dates and venues have yet to be fixed, but a likely date would be in March after the inter-regional festivals. The finals might be held at Hartpury College - or even at Kingsholm, home of Gloucester RFC. There is also a good chance of some sponsorship. It might be stretching a fantasy a bit, but can you imagine it if - say - the final was played before a Guinness Premiership game - girls' rugby in front of 10,000 fans..? That would be something! Regional tournaments would also need to be set up, but once the National Final is in place that should be easier. Armed with that the details of that carrot (and it could be a big one!) we'll be contacting clubs across the country telling them about what is being planned and encouraging them to take part. At least one of the venues from last season has already said they'd be interested in doing it again, and there could well be more tournaments than last year - maybe spread across several weekends - which would (in theory) allow clubs to enter more than one (which would be fun). "The RFUW through their local WRDM's will be looking at donating some money for clubs to run a local 7's or 10's tournament in their region. If your club is interested in hosting a tournament drop your WRDM a line as this could be good to promote your section. The 10s were obviously a success in/around your area and we are giving you the chance to repeat that success at an appropriate time with the help and support of your WRDM." And before you ask, in theory we would be interested in running an event - the only riders to that would be finding a date... and making sure that anything we ran did not clash with other tournaments in nearby regions or counties. There will be at least one major tens festival in May next year - the Worthing 10s (which we missed out on this year due to the National 10s and the RFUW's date mix-up) will be held on Sunday 3rd May, the bank holiday weekend and in between the final two rounds of the National Cup. May will also include the Dorking 7s (10th May), Herts 7s (17th May - venue to be confirmed, but in theory it should be Hertford's turn), and the National 7s (the RFUW calendar says Sunday 24th May but I strongly suspect it'll be Saturday 23rd) - so it'll be the usual exciting end to the season. As for the National 10s... well, I hear that the complaints have had some effect in as much as senior officials at RFUW have been heard to say that they are "surprised at the response" (which shows how much they have a finger on the pulse of the junior game). In the next week or so we should hear once and for all whether this "surprise" will have been turned into action, or whether HQ will have put on their tin hats and dug themselves in behind the defence of their (unpublished) "statistics". In the meanwhile keep the barrage of letters and emails going - its your game after all! Bad news from Brunel where it appears that (according to the Herts blog) neither Hayley nor Sasha have been selected to go on to the next stage of the TDG selection process. Apparently, from what we hear from those watching, Hayley seemed to have had a very good trial, but standards are clearly higher this year than ever before. Indeed Hayley and Sasha are not alone in their disappointment. Incredibly (comparing it with previous seasons) of the eight Hertfordshire U18s at the HPA only one made it through, and the one that did - Claire Shutler - was selected from the regional U15 squad. None of those put forward from the U18 squad were selected. So this means that the only girls from last season's Hertfordshire's U18s at this summer's trials will be the three girls who were in last season's TDG - probably the smallest group the county team has sent since the TDG process began? The IRB ELV video: your summer homework! Its just over 17 minutes long, but bear with it as its pretty important so please find time to watch it. Think of it as your summer homework. I know Simon from Saracens says there are better examples around, and no doubt there are, but this is the official guide and does have a useful voice-over commentary. It is, in short, the way the IRB say that the ELVs should work. I must say that the maul stuff (though not strictly relevant) does look pretty dangerous - especially as presumably IRB have chosen the "cleanest" examples. The video does explain why the change is proposed, but as solutions go... well, I'm just pleased that its not going to be introduced in junior rugby! Its also worth reporting that the ELVs debate is getting quite nasty (this New Zealand article ,and in particular the responses to it, are pretty typical). Its not inconceivable that there could be a real trial of strength between the RFU and other northern unions, and the IRB and the southern hemisphere (not sure where USA and Canada stand - a question that is far more relevant to the women's game). In what is seen by many as a shot across the RFU's bows, the IRB announced this week that the the worldwide "trial" will be reviewed "within the first quarter of 2009". Quite where we will stand if the IRB push ahead and the RFU and its allies insist on keeping their variations could be interesting (and quite damaging to the game). After all, its a racing certainty that Australia, New Zealand and South Africa will vote in their favour, so the north and south squaring off against each other in 2009 must be a possibility. One thing the video doesn't include is much about one major bone of contention between the RFU and the IRB - that of the replacement of many penalties (and scrums) with free kicks. There are other videos that cover this - including this lecture by a New Zealand referee called Paddy O'Brien (part 1 and part 2). Rather a lot of talking from the follicly challenged Kiwi, but the video examples are different to the IRB ones and maybe clearer at times. The RFU have circulated a new IRB video on the new laws coming in for next season. All clubs will have received copies (including RFUW registered teams, so I have been sent a copy as well). Its about 20 minutes long and I think is required viewing for everyone before the season starts. The only snag is that as a DVD its not easy to put on the blog without some a breach of copyright and - more importantly - some decent ripping software and related expertise. If anyone can offer that then please get back to me asap. Obviously it would have been slightly easier if IRB had had the idea of bunging the thing on YouTube - but, hey, the IRB executive (see right) is not exactly the YouTube generation (and all male too I note...). So perhaps when we have our first training session a viewing might be possible - and in the meanwhile if anyone wants to borrow the DVD before then get in touch. Looking at it I reckon that - given the maul changes will not apply - the big area where the ELVs will have an effect is in the line-out. The fact that numbers put into the lineout by each team will no longer need to be the same opens up all sorts of tactical possibilities. As the defending team do you put extra players in to try to steal (but therefore have fewer in the defensive line)? The quick throw becomes much easier to perform as well. Its not something we have used, or ever seen, in our games but maybe we should be looking at it in future? Why? It won't cost you any more, but the club will get money back from any tickets sold via the above link. Middlesex Sevens is on 16th August at Twickenham and will feature teams from all the Guinness Premiership clubs, plus Leeds, Ospreys and Dragon from Wales, and the British Army (who are seriously good at this game). 22 matches in all, including both a cup and a plate competition - a great day out with hours of continual action from the leading male players in the country (but no England women's exhibition game this time, unfortunately). All for £25 for adults and £10 for children. The guilty expression says it all - but what was Nikki up to? Thanks to Mike for passing on some more facts to go with the short note I posted earlier. To begin with, strictly speaking this was a Letchworth RFC event, but the contribution of the girls' section was out of all proportion to the rest of the club (as a glance at the pictures will show) so its very much OUR success. Certainly without the efforts of Mike, Heather, Simon, and all of you who turned up it would never have happened. Five Letchworth primary schools took part - Lannock, Lordship Farm, Grange, St. Thomas More, and Radburn - a fact that is impressive in itself as some of these schools do not regularly take part in these sort of events, so we were tapping into a "new" seam of interest from the very start. Twenty-eight teams took part in four separate competitions - year 4 girls, year 5 girls, year 4 boys and year 5 boys - which mean that over 380 players were present making it possibly the largest event Letchworth have hosted since the Herts Sevens in 2006. In addition we had four main sponsors - NHDC, Herts CC Youth Opportunities fund, MBDA UK, and Eden Bridge Toyota - which again is pretty impressive. Sixty matches took place spread over six pitches, with games running from 9.30 in the morning t0 2.45 in the afternoon. Every player went away with at least a certificate, while age-group winners received shield plus medals for all the squad. An overall winning school was also determined by combining the results from each group - and they received the champions shield donated by MBDA UK. Awards presented by the Chair of NHDC and Heather (on behalf of MBDA). Thanks especially to Mike, we are one of the most active members of the Sports North Herts. Yesterday evening was filled by one of their quarterly meetings, and a few things that came up - though not directly rugby related - sounded interesting. North Herts currently gives grants for "elite" sports people (see earlier article), but does not have any "hardship" fund - ie. to assist potentially talented sports people who, perhaps, might need some help with equipment or travel to trials etc., but SNH are now going to look at setting up such a fund. An inter-club rugby forum bringing together all local clubs to discuss matters of common interest is planned for September. As this means that officials from both Letchworth and Hitchin will be in the same room together the UK Peace Keeping Force has been put on stand-by... However, more seriously, it will give us the chance to ask other clubs, face-to-face, what they do with their girls after the age of 12. On 24th August there will be "mini-Olympics" events across North Herts, including the Sports Centre. Quite what this will involve, and whether there will be room for us to get involved in some way, is as yet unclear. Rugby isn't an Olympic sport, obviously, but its not impossible that they might not have some sorts of athletic events that we might take part in as a team, for instance. Over-45 Games. The other end of the line from Youth Games. Apparently a pilot event at Hatfield went very well a few months ago and so a North Herts Over-45 Games is now being considered for next year. You may want to start putting your parents through a training programme now - especially as the Hatfield event included tag rugby. School rugby for girls (other than tag) is not exactly a major sport, especially in secondary schools. The reasons are many - not least the conservatism of PE staff - but the major factor in the games' favour has always been the flexibility of age groupings that basically meant that as long as you could get some girls together it didn't really matter which years they were from as long as the age gap from youngest to oldest was not bigger than three years. Well, all that wonderful flexibility has just gone out of the window as RFUW have announced that from next season schools will have to play to the same age bands as clubs. This means that girls in Year 7 can only play amongst themselves, or have to play with the boys (like that is going to happen!) - so your chance of grabbing new girls into the game while they are fresh and open to new ideas, and before the cynicism and routine sets in (ie. around Week 2), is now largely blown away. Okay, things recover a bit in Years 8 upwards but even so its another barrier for U12 girls wanting to play rugby (as if there were not enough already). I know its a good idea for everyone to play to the same rules wherever they are (though boys' rugby famously doesn't! ), and people will shout "insurance" and stuff, but come on... Exactly how many injuries have there been under the flexible three year age band system that will now be prevented by rigid three year bands? Do I hear none? So if its not a safety issue what is it - administrative convenience, perhaps? For heavens sake everyone - given the state of our game its all about participation. Its about getting girls to play. Its about time that that was pushed to the forefront of the minds of all decision makers instead of talent spotting and England pathways and the 101 other considerations that are irrelevant to 80% of girls who want to play (or would do if they had the chance). If ONE more girl takes up the game as a result of this change I will be amazed. On the other hand if girls are lost to the game as a result of the change I will not be the least bit surprised - indeed I go so far as to say that its a racing certainty. A brilliantly successful tag festival took place at the club yesterday, with a disproportionate amount of the organisation and running of the event coming from the girls section (Mike, Simon, Wonky and others). Unfortunately I missed it all due to an outbreak of German Measles amongst staff in a school in Bedford (food tech... French... social studies... I know where I would rather have been! ), but I gather that some 400 children played in a tournament that lasted throughout the day and that Lordship won prety much everything. One great thing I heard from the NHDC people there (thanks to the council without whom it would not have been possible) was that the vast majority of children there were "not the usual suspects" - ie. the children who turn up to every sports event - so maybe we might attract a few players from it all.... here's hoping! If anyone who was there has any more information or insights (or pictures) please pass them on. Such a great success deserves all the coverage it can get, so let's tell the world what brilliant tournament organisers Letchworth RFC are (and especially the girls' section)! If you applied for a grant to cover costs as a county or regional player then you should have heard from North Herts District Council by now - or Sport North Herts as the body that runs this scheme is now known. Apparently they have £5,000 per year to distribute to talented sports people in the district, with awards made every six months. The latest awards were decided at the end of June, with grants going to 23 of the 30 people who applied. Most of those who were rejected failed because they did not live in North Herts (the basic criteria!) while the rest "failed to provide sufficient evidence" (ie. you need to prove you played at the level you claim - a letter from your county or regional manager would do). Awards in the past have been based on expenses, but now they are a simple flat rate dependent on the level reached (and also the amount of money available). This time the funding given ranged from £200 for those playing at national level, to £125 for regional representatives, and about £100 for those who played for the county - not huge sums, but enough to make an impact on costs (ie. paying for training fees and kit, for example). Looking at the number of grants - and even the number of applicants - and thinking about how many people play sport in North Herts - either virtually half of all the grants went to our girls... or quite a few of you did not apply. If the latter is true, why not? After all, if a £100+ cheque is not sufficient incentive for you to put pen to paper then maybe we should put the club membership fees up next season! The next round of grants will be decided in November - so if you get though county trails in September make sure you apply! The pot will be a bit smaller as the SNH have only £1.8k left, but that is still money that could be in your back pocket (or your parents' petrol tank) so remember to apply - Sport North Herts c/o NHDC. Incidentally, grants are also available to coaches - and come to that adult sports people. Women's rugby is not high profile at the best of times, but a tournament starting today gives media invisibility a whole new meaning. And interestingly enough its not the RFUW - or the RFU's - fault as they are not concerned with selecting these particular international teams. This weekend will see the third World Student Rugby Championship, in Cordoba. This sevens tournament takes place every two years and the current holders of the women's title - and they are going for a hat-trick - are... not England, but Canada (who - incidentally - are the only participants whose rugby authorities are giving the tournament any coverage at all). In fact England aren't even there - its a Great Britain team, selected by BUCS (British Universities and Colleges Sport - an organisation that many of you may become familiar with in a few years' time). And they will be up against not only Canada, but also France, Spain, Italy, and Bulgaria. Okay, not a great cross section of the rugby world, but other nations were invited by declined to attend. You can only beat the teams that turn up. The tournament starts on Thursday, and GB must be in with a good chance - though who is playing for the team is a complete mystery! But despite it all this is a tournament worth watching - after all maybe come 2010 or 2012 or 2014 one the players in the squad might be one of you? Hopefully Mike will be publishing his photographic account of the weekend's displays at Rhythms of the World in Hitchin (North Herts' answer to Glastonbury). Clashes with other sporting acitivities prevented me from being there yesterday, but today the family's cricket and swimming were over in time for me to get over to Hitchin for the second day. So first well done to everyone who came along - it was a good display, justifiably attracting a significantly larger crowd than the earlier folk dancing. A slightly larger arena would have been nice, but the two sides of the fence accessible to the public seemed full throughout - which was pretty good. We need to grab every chance we can to do this kind of thing - a hundred or more people will now know that there is a successful girls rugby team at Letchworth, which is one step nearer attracting more players. Probably the only downside today (I cannot talk about yesterday) was the commentry - "John, could you go over and see the organiser" I was told. Having made my way round a mike was thrust in my direction - "take this, talk into there" - resulting in 30 minutes of improptu jabbering. Its amazing what rubbish you hear yourself saying in a desparate bid to say something - "Girls' rugby is a sport for everyone... Well, just girls obviously" - and that is just the one I remember! At least I didn't get anyone's name wrong... I think? Anyway - the great thing about the weekend was that by and large the rain held off (a few drops on Saturday, nothing today), large quantities of leaflets were handed out, everyone enjoyed themselves, we all got into Rhythms for nothing ("artists this way..."! ), and maybe - just maybe - one of those watching might come along and have a go next season. Next year all we need to do is put it to music so we get on the main stage! Should the season have begun already? Looking at the clock there are still over 56 days to go before our season begins, but looking around at other clubs sites you may get the impression that the 2008/9 (or at least serious training for it) has already begun. Should we be doing the same here? At Letchworth we have always had a clear break between seasons - an "early start" for us would be mid-August! And its pretty much the same across the club - weekly touch rugby aside - none of the teams, certainly none of the junior teams, will start training until well into next month. So why do other clubs do this? Does this early training make any difference - are we at a disadvantage but not training in the summer? Its difficult to prove things one way or another - there are so many other variables, especially the ages and individual abilities of players - but going by last season the difference seems to be marginal. At the start of the season teams that have trained in the summer do tend to hit the ground running, but by season's end, when the major tournaments come round, the difference seems to be slight. There is, however, one exception - and here it is quite relevant to this weekend. As mentioned earlier this week, Hayley and Sasha will be competing for places in the TDG this weekend and, while I do not know about Sasha who may have done some training at school, I am pretty sure that Hayley will barely have picked up a ball in recent weeks. Obviously the HPA/TDG process is designed to identify raw talent, and so recent training (or the lack of it) should not make much difference. However all of the girls at Brunel on Sunday, and at the next session in a couple of weeks time, will be very talented - there will be little to choose between them. A few weeks extra training could make all the difference, especially as the process excludes consideration of reputations and past performances. Maybe, at the margins, it has made the difference in the past? Its more than just Hayley and Sasha - it could also make a difference to the playing opportunities of others. County selection is very early in the season, but performances in these early September trails influence regional selection later on - because if you miss out on county then, however much you may later develop, you will also miss out on region too. Could summer training account for how under the old system we had girls who made it into regional squads but were not selected for county teams? Some of you have other "explanations" for such notable features of previous selections, but I suspect summer training may be a significant one. So should we be training through the summer as well? Personally I still think not. I think the RFU is right to have a well-defined off-season, from June to August with its implication that players should take a break from the game. This is an amateur sport - a past-time not a life-time. There is the touch league if people want to keep fit and aren't doing anything else - maybe we might look at taking a more active part in that in future seasons - but I'm not sure we should follow other clubs down the route of formal summer training. The latest issue of Touchline is out - paper copies from RFU or view it online. We get a mention (again) on the RFUW pages in a report on the U18 National 10s last season. What is particular interesting about this short article is what it does not say - no hint here that the event was undersubscribed, or that there was any likelihood of it being cancelled. Indeed it gets a very high profile with the headline "Worcester Win Under 18s Title" (not "U18 10s title", for instance). You could be forgiven for thinking that the author of the article thought that the 10s was the major event in U18 rugby, rather than merely the second year of a failed two-year experiment. Why else given such prominence to something that you were planning to do away with next season? "Left Hand, meet Right Hand - I don't believe you know each other..."
Dave Sharp has written to remind everyone that Part 2 of the Great Club Tidy-up is on Saturday, from about 9.30. Most of the work will be indoors this time which, given the weather forecast, is no bad thing. Main tasks will be some minor demolition in the shop, brush and paint work on the portacabin and barrier, boarding up some windows, repairing some floors, and rounding off with some fencing (swords will be provided). Free BBQ and other refreshments as before. Amatuers? Its a full-time job in the England Women's rugby team! Barely weeks after the FIRA European Championship and Sevens tournaments the England team are now starting to prepare for a series of five internationals next month, three of which will make up the first "Nations Cup" tournament. The only downside to this is that the Nations Cup - for reasons unexplained - will not be quite as ambitious as was first suggested. No Wales or France will limit the tournament to a three game round-robin involving England, Canada and the USA to be played between 22nd and 26th August at Esher RFC. In addition, and presumably to compensate their visitors who would otherwise be travelling a long way for not much rugby, England will be playing an extra international against each team outside the Nations Cup event. A 30-strong squad has been named - details on the RFUW website - no great surprises, but some of you will recognise a victim of one of Nim's most famous tackles in there! One week on from when the meeting with the RFU there is the first sign that something serious happened (we can only guess, though, as RFU and RFUW can teach Trapist monks a thing or two about keeping things quiet). There are exciting times in rugby in England, in hundreds of rugby clubs across the country women and girls are playing rugby. This Head of Development role will be responsible for ensuring women’s and girls rugby becomes a fully integrated part of rugby in England. You will work closely with colleagues from the RFU, Sport England and the other delivery agencies to ensure that there are as many opportunities as possible open to women and girls to play rugby. You will lead a highly motivated group of development staff who are already working closely with the RFU to deliver the rugby objectives of being a game for all. You will play a vital role in the RFUW Senior Management team, setting strategy and ensuring delivery of programmes to deliver the aims, you will also play a vital role in the RFU Community Rugby Senior Management teams representing the needs of the women’s game but also using your skills to influence the success of the game as a whole. * You must be enthusiastic about rugby for all. * Be prepared to take on a challenging role. * Able to manage people and relationships. * Act strategically and offer vision and commitment to delivery. * Want to be part of a young vibrant and highly motivated team. Leaving aside the content for a minute, £40k is serious money for the RFUW - salaried posts at the Union are rarely advertised at much above two thirds of that, and most of what they do is (as we know) managed by volunteers. Indeed considering the generally parlous state of RFUW finances it is not stretching things to guess that this is being funded by sources elsewhere - RFU, presumably (or maybe Sport England), determined to see progress in any merger/integration. Anyway if anyone out there fancies a real challenge checkout the full job description, then forward your detailed CV and a covering letter to Susan Allen, RFUW, Rugby House, Rugby Road, Twickenham, TW1 1DS (or by email to susanallen@rfu.com). And hurry. The closing date for receipt of applications is 31st July 2008 and interviews will be held in Twickenham on 11th August 2008. Hayley and Sasha are off on SUNDAY [not Saturday - that'll teach me to rely on information on the RFUW website!] to Brunel University in North London, but not with anything academic in mind. While rugby for everyone else has finished, and we still have two months to go until next season, for these two girls the 2008-09 season effectively begins here - at RFUW's High Performance Academy (HPA) - where they will compete for places in the elite U18 Training Development Group (TDG) (there is nothing RFUW likes more than a good acronym!). This consists of the leading 30 girls in the country who receive extra support and training during the season, take part in the junior "Super League", and also play against any touring national teams* if they are in the right age group. About 100 girls will be attending, and the top 20-30 will be selected join last year's TDG at a final selection at Hartpury College in August. Sasha was in the TDGs for 2006-07 and will be trying to win back her place, while for Hayley this will be her third and (as its her last year in the age band) final attempt. Hayley has made it through the first selection on each occasion to date, but has yet to make that final step. Hopefully it will be third time lucky this time. *Footnote: It is worth saying that (surely?) in any other country the "TDG" would be the national U18 squad, but RFUW have a strangely precious attachment to the word "England". Admittedly they are selected as the best 30 girls, and not as a balanced team, so (in theory) there could be eight scrum-halves and no props but, that minor quibble aside, the needless bureaucratic precision is annoying - especially when you try to explain it to grant making bodies or the press! Personally I fail to see what is remotely gained by being so pernickerty - well, other than presumably making it difficult for the girls to access grants that they might otherwise be eligible for if they were "England U18s". Oh - and losing out on some screeds of good publicity because newspapers are (not unsurprisingly) unwilling to try to unravel the complexities of the concept. <Sigh>. This year's Superteams - due to take place on Sunday at Hatfield - has been "postponed until the Autumn", which is a pity as this presumably means that there is a real chance that it will clash with a match (though as no date has been released we do not yet know). No reason for the postponement has been given, but this does mean that you will all now be able to support our display at Rhythms of The World on both the Saturday and Sunday (as well as a enjoying a bit of music). The displays will take place in the "arena" area of the site from 4.45 to 5.15 on both days. Wonky and Katie will be on the PA, Simon will be refereeing, and those not playing will be leafleting the crowd. If you are around and have not already put your name forward then let Mike know asap. ELVs are here - as RFUW confirm their "support"
Last weekend was quietly historic as it was the first weekend to feature the new Experimental Laws (ELVs) worldwide with the most public example being the Tri-Nations game between New Zealand and South Africa. From now on every game you will see will (or at least should) be played to the new laws. The detail confirms that all the ELVs will apply to women's and girls's rugby, except for the Law 17 Maul ELV which will only apply to women's Premiership and Championship leagues - ie. not the lower levels of adult rugby as these are played to U19 laws - and also not U18 or U15 rugby. The full statement appears on the Herts blog. This is close to being one of the maddest rugby websites I have ever seen. Its also close to genius. And moreover it is of some practical value. Rugby-sidestep-central is a website about... the sidestep. How to do it, how its been done in the past, great heroes of sidestepping, sidestepping around the world... need one go on? Apparently so because Peter Dawson (a man who loves to use bold text at every opportunity and the slightest excuse) does indeed go on about it. At length. There are also videos and explanations and even some stuff about rugby in general, but basically if you read more than one or two pages of Peter's opus and are still unable to sidestep then... shame on you! Rugby website in equal coverage for women's game shock! If you are looking for a rugby news site and are bored by the official sources, or frustrated by the minimal coverage of the women's game on the major independent sites, then take a look at Rucked.com. Of all the sites on the web that I have read this one seems to treat women's rugby as it should be treated. Not by ignoring it, nor by giving it its own little section tucked away somewhere, nor by giving it the "gosh, they really can play". No - rucked just treats women's rugby like any other branch of the game. So we have a coaching article from England women's coach Gary Street alongside articles from other coaches, an article on a women's club alongside articles on men's teams, and Gary Street talking about his ambitions for England women alongside pieces from Guinness Premiership coaches (the latter is particularly interesting, incidentally), and more besides. In short it is an example of how the game should be reported - and well worth dropping in on whenever you have the time. Although protests continue to arrive at Twickenham, the latest responses I have seen appear to indicate a certain digging in of heels. The current line is that "detailed statistics" indicate that the 10s was not as popular as we may have thought - apart from in certain regions. What those statistics are is not revealed, which is a pity as a) two out of the three regionals heats last season seemed to have a pretty good attendance, so the Northern heat (which I do not have data for) must have been a complete disaster (can you have a negative number of participants? ); and b) if the stats for the 10s are poor one dreads to think what the stats for the National Cup look like - yet that event continues! RFUW then go on to say that clashes with exams were a problem - which is unarguable, though presumably the solution to that would be to maybe not hold the competition in the middle of the exam season rather than cancelling the whole thing. Or am I missing something here? Apparently RFUW are discussing all this on a number of rugby fora. Exactly which fora is unclear - certainly not the RFUW's own forum, nor this (despite the fact that there has been a flurry of log-ins from RFU.com addresses in the last couple of days - so they know we are here), nor Women's Rugby Review, nor... well any others in the UK top 10. If any of you do find which forum they are using please let us all know (not least because it'll probably be a site I have never heard of!)! The bottom line is that at the minute HQ shows no sign of backing down. However as they have not actually officially announced anything about the cancellation yet there is room for manoeuvre if they wanted to take it, so please keep writing to them! In the meanwhile a chink of light is that they say that the tournament might be "club run" instead of being run by RFUW, which is actually something we were already looking into... so watch this space - one way or another the 10s is not dead yet! Some strong support has now appeared on the RFUW Discussion List from Ian White, who some of you will know as the physio for East Region - so we are not alone (as is normally the claim whenever we complain about anything!). 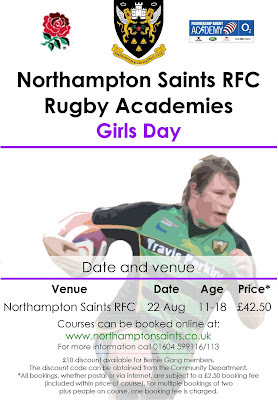 Its just over an hour from Letchworth, so some of you may be interested in a special "Girls Day" for 11-18 year olds being run by Northampton Saints at their ground on Northampton on Friday 22nd August. Sounds a bit like the Saracens academies that some of you may have been to in the past. Its £42.50 for the day, which is also comparable to the Saracens days I think. Details a bit thin beyond the poster and booking form, but as Saracens do not appear to be running a girls day this summer (unless anyone has heard otherwise?) this will be the best alternative. No doubt one or two Kettering girls will be in attendance - quite who else I'm not sure. A new attempt is being made to launch an independent women's rugby magazine. Its not a new idea - there were similar announcements last year but nothing eventually came of it. However, Susan Hughes, director of the imaginatively titled "Women's Rugby Magazine", tells me that they already have the backing of Paul Morgan from Rugby World, and have already secured interviews with the likes of Donna Kennedy, Hertfordshire's own Michaela Staniford, and Rochelle Clark. The intention is that the online magazine will incorporate information from grass roots right through to international level, and in advance of an anticipated September launch Susan is looking for "any pictures or info, funny stories etc that you would like to submit" (bit difficult to know where to begin on that one, Susan!). The magazine will appear monthly, with an annual subscription fee of about £12. So if you fancy launching a career in journalism, or have any comments, suggestions, ideas, or photographs that you think might be useful or interesting then Susan will be delighted to hear from you. Contact her at womensrugbymagazine@live.co.uk. Coming soon: rugby kit that fits! At long last a company has been set up that recognises that girls and women are different shapes to men, and that rugby kit designed to fit the latter does not always fit the former. However its not the design geniuses at giant companies like Canterbury or Kooga who have spotted this, but a former player running her own small sports clothing business in London. Katy Miller, owner of Divasport, began recently with women's sizes and designs for things like tour t-shirts, and has now announced that she will soon be expanding - producing not only playing shorts "without the big baggy bit at the front" but also full kits as well. It is intended that the range to be launched shortly throughout the UK- will be totally dedicated to women, providing what Katy calls "proper sportswear and accessories, proper sizes, and excellent prices!". Katy has set up a Facebook page (quite the in-thing this, isn't it?) as well as a website - the latter also providing a noticeboard for women's club news and events (apparently we will be on there soon). Worth keeping an eye on, especially if you have anything that needs replacing for the new season. Fascinating news out of the West Country where some pioneering work is showing that there is another way to develop girls' rugby in an area than the "traditional" RFUW/CB/County forum route. Admittedly it still needs support (ie. in this case from a Guinness Premiership club) and the usual band of dedicated volunteers, but its different, refreshing, and above all working for the girls of Gloucestershire. Gloucester Girls Rugby Charitable Trust Fund (GGR) was set up last year to provide "rugby and lifestyle skills to girls in Gloucestershire". It grew out of a "standard" county programme that wasn't working in that it was "failing to the give girls the development opportunities they required and deserved" (draw you own conclusions about what this really means, but the organiser behind this had reached RFUW regional manager level before she... left). Interestingly the aim of the charity is broader than just rugby, providing "life skills in nutrition, general and sexual health, and fitness and injury prevention". One of the other key aims is to raise girls' aspirations across the board (not just in sport) by increasing their confidence and self esteem. This has allowed the GGR to tap into a wide range of funds and other help which is not generally available to programmes that follow the "standard model". The programme is also not restricted to the usual age ranges - ie. it does not throw 18 year olds out into the adult game and leave them to it. There are programmes for Under 12s, Under 15s, Under 18s, and 18-24 year olds. The younger age groups meet on a Saturday morning and over 100 girls regularly attend. Overall 75% of the U15 and U18 players represented county or region in the project's first season. One factor I like about it is the way in which the project aims to support the girls as both individuals and as members of a team - a major criticism many of us have is that the Standard Model majors in the individual and seems to forget teams entirely. Also from its inception the scheme set out not to just recruit girls into the game, but also to "make a significant effort to ensure that they stay within the game" and above all placed a "huge emphasis on ensuring all girls wishing to play rugby could do so." The programme also aimed to tackled U12 drop-out - something that at a national level remains patchy, to put it mildly. "The main aim of our Girls Development programme is to motivate and inspire girls to stay and succeed in the game regardless of level of performance, returning to club rugby or indeed finding their way into County and Regional representative Rugby". No elitism here, then! All in all its stirring stuff. How portable a model it is is difficult to say - but its clear that it could not have been done (well not at the level it has) without the active support of Gloucester Rugby Club and Premier Rugby Ltd, so you still need access to a modern organisation with some business as well as rugby expertise (something which allowed Lisa Walsh and her dedicated team of volunteers to raise an amazing £20,000 in their first year). But if you have access to that then it is clear that you can successfully generate your own path to success. The further development of GGR will be something that we should all watch with interest over the next season. Meanwhile the project celebrates its first birthday with a Charitable Ball (the dancing type, not the one you throw around!) on 9th August. Good luck from Letchworth - and have a great evening, everyone! For more information and contacts you can go to GGR's Facebook Page or various articles on the Gloucester RFC website such as this. I have now had a reply from HQ about the National 10s - but it seems to raise as many questions as it answers. It is confirmed that there will be no National 10s next season, which is clear enough. However the reasoning... well, the more you look into it the more questions it raises. Apparently the main justifications are that it was a only ever a two year experiment and "there has not been the interest in the Competition to keep it going as a National event". It is hard to see what this means, and even harder to understand the justification. If by "national event" the RFUW mean the National Finals then it difficult to know how it could have been more successful! In two years the U18 national finals have only had one no-show out of 12 entrants - as good as the National 7s in recent years, and there is no question of cancelling that. Despite everything the weather threw at it in 2007, both finals days must be counted as major successes. So perhaps the concern was the lack of entrants at regional qualifiers? But this makes even less sense as the combined entry this year was at least comparable to that of the National Cup (possibly bigger) - and certainly featured more "real" club teams. The reasoning is clouded still more when I am told "there will be local tournaments out on in your area", but no hint of a date - there is no date in the calendar. The suspicion has to be that this cancellation is solely due to the senior event having problems last season - but why should that have any effect on the junior event? Mind you if the aim is that junior competitions always parellel senior events then that would at least explain (if not justify) why the National Cup rolls on from year to year, regardless of the ill-feeling it creates. If anyone gets any replies which provide any answers to the above posers could they please let me know? While researching something else (more later) I discover that Mel created a Letchworth Girls page on Facebook... last November by the looks of it - see here. Only a few of you seem to have joined it so far, and its not a wildly active group, but if you are into Facebook then I am sure Mel would welcome your contribution. And while you are there you can also find an England Women's rugby supporters group, and also a group for the main club. Flicking through the latter will reveal a few familiar names (ie. the odd coach or two).